Thrift stores: they're an assault on the senses. The racks and racks and racks of clothes. The music playing overhead on damaged speakers. The Febreeze. Oh, the febreeze is thick as fog. And the clientelle... it's a group you wouldn't find in a Nordstrom. But then again, you wouldn't find me in a Nordstrom, either! Ok! So. Why do I love thrift stores? Because I got tired of finding myself 2 months post-partum in the summertime, and having no shorts that fit. I refused, REFUSED I TELL YOU, to put my maternity shorts back on, and yet my regular shorts were still a good 2-3 sizes away from fitting. I got tired of being six months post-partum in the spring and having zero shirts or dresses that I could wear to mass and nurse in discretely. Cue my Sunday morning meltdown. I got tired of being four months pregnant in the winter and having to dig out the maternity clothes, only to realize that last time I was pregnant, my first trimester was in July, not December, and I had exactly zero pants that fit. Back in January when I wrote about my losing battle with minimalism, Sean and I added up how many sets of clothes I need to outfit myself in the various combinations of pregnancy/post-partum/nursing in summer/winter. It's a FULL 10 SETS OF CLOTHES. My wardrobe is full of 100% cotton button-downs because they are a workhorse of a shirt. They stand up to being washed weekly. They are universally flattering. If I hang them up while slightly damp instead of drying them all the way, they don't need to be ironed. And, most importantly, I feel great in them. Gap and Land's End made great cotton button downs. I can usually find good Old Navy ones as well. When I'm thrifting, I generally skip over shirts that are knit blends of rayon or polyester. Even if they're in great shape on the rack, they're still more prone to pill, wrinkle and fade as they're washed. 3. Shop for bottoms IN ANY SIZE. When I need jeans, black pants or khakis for mass, or skirts for every day wear, I flip through the racks in both my normal size, then also a size down, and a size up (or 2). Obviously the items in thrift stores come from a hundred different brands and manufactures, and so sizing is all over the place. I'm nine months post-partum and my current rotation of bottoms (all thrifted, by the way) contains items in size 6, 8, 10, and 12! I don't let a number dictate whether I'll try on something. I get a victory in walking out of a thrift store with a pair of J. Crew chinos that make me feel confident. I could care less what size they are. 4. Shop for bottoms, actually, all the time. Jean and pants are a terrific aisle to start in for someone who hasn't done much thrifting before. My theory is that women discard their jeans and pants way before they're either out of style or worn out, either due to their size changing (*raises hand*) or making room for other items in their closet. Either way, the thrift ladies win. Thrift stores are chock full of barely-worn ladies' jeans and pants. Carpe denim. Thrift store dressing rooms often leave something to be desired--namely, clean walls and fresh air. I try not to spend more time than absolutely necessary in them. 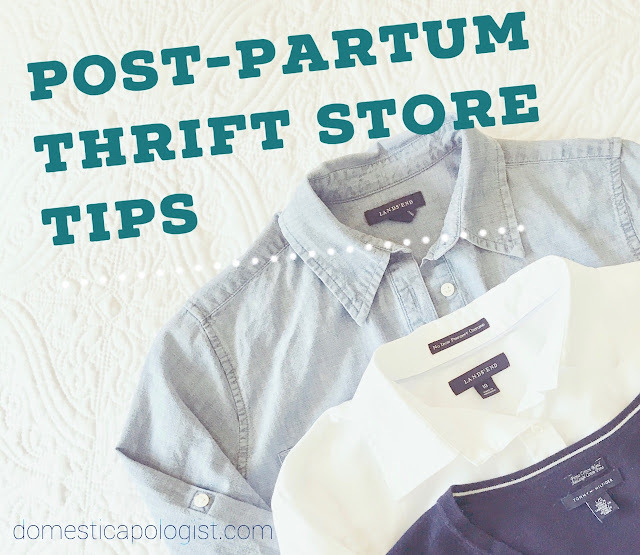 Pants almost always need to be tried on, unfortunately, due to tip #3. But with shirts, if I've got a good feeling about a piece, I'll often bag it without trying it on. At about $3/shirt, I'll take the risk. 6. Save more money with extra discounts. I never seem to remember this but on Sundays at all (I think) Goodwill locations, one color tag is discounted to either $2 or $1. On any given day at my favorite thrift stores, tags of three different colors are either 25%, 50% or 75% off. Some thrift franchises even have points/reward programs. Some ladies are superhuman and are able to navigate thrift stores, dressing rooms and crowded aisles of used junk, all with CHILDREN IN TOW. I am not one of those women. And with that, my bag of tricks is empty. If you're a fellow thrifter, I'd love to hear how you score the deals. Linking up with the Kelly for quick takes! I love all the dresses and tie-dye dresses you picked out. Some very cute shoes, also. As a budget shopper myself, I loved this post. I want to visit a used clothing store soon.